>The intrepid round the world sailor, 16 year old Jessica Watson from Australia passed the Cape of Good Hope this week to begin her final leg back to Australia. While she still has some 5,000 miles to go, passing the final cape on her voyage is a major accomplishment and one that will certainly earn her a place in nautical history as a tough young women making a round the world voyage at a young age. Jessica has been covered widely in the news and one of the more interesting videos I have seen of hers and other similar voyages by young people is worth checking out. It was posted by ESPN and is a good overview of the controversy surrounding Jessica’s voyage as well as other young people in the last several years. Normally I would inbed a video frame but for some reason ESPN has disabled that feature on YouTube. Check out the video by clicking here. The 33rd America’s Cup was also decided with a decisive victory for the BMW/Oracle team in a two race sweep. Personally, I had become a bit jaded about the race given all of the legal wrangling over the last few years. However, to see these two massive boats racing was quite magnificent and worth tuning in to. Unfortunately, the races were not broadcast on any station in the US but could be watched on the Web in streaming video. The two videos that follow are highlights of the two races. Really interesting. Now, back to my own, ever so humble, Pandora. It’s just over a month until she goes back in the water and there is lots to do to get her ready. The last few months has been particularly busy for me at work as I will soon leave a position that I have had for over 16 years as a division President at a private publishing company. Our company was sold 5 ears ago and my contract with the buyer is up as of the end of March. It has always been my dream to do something on my own and now that the new company, hard hit by the recession, has decided to sell one of my two divisions to yet another buyer, I have decided to go out on my own and form a new company. Anyway, I have been really busy for the last few months but not so busy that I can’t think about Pandora and the coming sailing season. However, between work and the terrible winter weather I had not even laid eyes on Pandora since leaving her at the marina dock as she was prepared to haul back in November. My visit to Annapolis last weekend was nearly two weeks after the big snowfall with 4′ of snow dumped in the area and I didn’t know what to expect. Well, the snow didn’t disappoint as there was still plenty on the ground when I arrived. The cockpit was filled nearly to overflowing but happily everything down below was dry and snug. I have pared down my list of major project list down to three major areas. Have the mast painted and replace all standing rigging, remove and refurbish the Max Prop and replace and enlarge the aft holding tank. I am also installing a cell phone booster to provide much more solid cell and Internet reception in areas where cell reception can be a bit spotty. They say that this system will provide for good coverage up to 50 miles from a cell tower. That should about cover it for the east coast of the US. I was going to raise the waterline a bit but that will have to wait until next winter. Along with the rigging upgrade I am adding a running forestay to fly a storm jib as well as setting up the main with a 3rd reef. With my plans for more offshore work in the coming years, I needed to adjust my sail setup for more extreme wind conditions. The ESPN video I linked to above gives you an idea of how nasty conditions can become sometimes. I want to be sure that Pandora is set up for such conditions. My to-do list for my visit last weekend was to remove a leaky holding tank so that I could have a new one made that would allow for greater capacity. While the tank is out I also needed to clean up a messy bilge from years of seepage and other lovely problems related to storing raw sewage aboard. The bilge had gotten a bit smelly and needed attention. The tank came out fairly easily and with a bit of work I was able to fit a cardboard template into the spot. I have now had the flooring up several times on Pandora and fortunately, it’s pretty easy to pull up the panels and expose the bilge. This shot is after I had cleaned things up a bit. 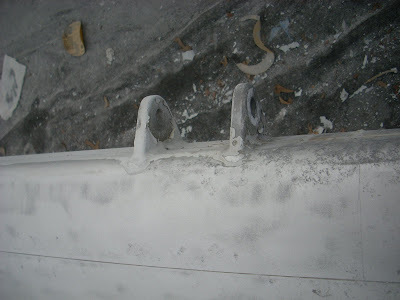 The amount of crud under the holding tank made it really obvious why the bilge was smelling nasty. There is still lots more cleaning left to make it presentable for the new tank which will more completely fill the space available. By increasing the size of the tank I will have about 50% more storage. The tank goes in the forward section ahead of the bilge pump. I have also had the mast painted professionally and these before and after shots show what a fabulous job they did. Really nice work. Lot’s of $$ going into a very nice job. The top of the mast, looking good, perhaps better than new. Amazing how the same hardware reinstalled looks like it’s totally new. It’s from 1998. Just terrific. No, this is not a new winch. This mast is over 65′ long and it looks very big when it is on the ground. I am so glad that I decided to have the rigger handle all of the work as the job looks overwhelming to me now that I see the scope of it and think about how I was thinking of doing some of the prep work myself. What was I thinking? The new holding tank will be ready next week and the plan is to head back down to Annapolis on Friday afternoon to reinstall it. The best part will be schlepping buckets of water from the yard bathroom to the boat so I can more completely clean out the bilge prior to reinstalling the tank. I should probably replace the head hoses as well while I have everything torn up. That’s surely going to be fun. Our plans for sailing this summer will be April and May in Annapolis, June in Mystic CT, part of July in Wickford RI and on to Maine for August. And, with my nifty new cell booster installed, I will have better cell coverage on board so I can spend some of my work days aboard. Just a month to go. I had better stay focused on the April launch date. Yikes! >The America’s Cup, second race. >It’s Sunday morning and in Valencia Spain BMW/Oracle Racing is waiting to hear if the race committee is going to declare a today a race day and competition for the 2nd race of the America’s Cup. With all of the legal wrangling it’s a bit hard to be excited about the race as it’s seemed more like a race fought in court and less about being out on the water slugging it out around the race course. However, I have to admit that as I have watched videos of the BMW/Oracle boat and promotional information being sent out by BMW/Oracle Racing it’s become clearer just how impressive a machine that boat really is. Until yesterday when I watched a press conference from BMW/Oracle Racing I had been focused more on the two billionaire owners sparing and didn’t appreciate that while it’s certainly that, it’s also a platform for Oracle to showcase their software and programing abilities to the world. To listen to some of the details of just how sophisticated the boat is and the network of sensors that the boat is armed with was more than impressive. One particular example is the ridged wing sail. Unlike “soft” sails, this wing doesn’t show if it’s properly set because it can’t luff. The only way to tell if it’s set properly is to read the loads and wind angles as displayed from instruments and sensors placed around the boat and on the “sail” or rather wing. The crew watches the output on “heads up” displays projected on their sunglasses. As you watch videos of the boat note that the helmsman is wearing a backpack. That’s where the electronics that run his display is housed, receiving data from all over the boat. That’ boat is indeed a gigantic floating billboard for Larry Ellison and the impressive capabilities of Oracle. This video newscast from some months ago provides some context to how the Cup has been pursued over the years and some of the outsize egos that have pursued it. Ellison’s legal rangling was successful and now they are in Spain and competing. I am hopeful that a summary video of the first race will soon be available as I did see one at the BMW/Oracle Racing site but haven’t been able to find a posting that’s available all of the time yet. The first race was quite interesting as it showed that BMW/Oracle Racing was able to win after a really botched start that had them crossing the starting line some 3,000′ behind the Aligne and ultimately winning. The power of the massive BMW/Oracle boat flying two of three hulls is quite something. To get a feel for the scope of the boat, check out the specs page for the team. Be sure to click on the graphic on the specs page to see what these specs look like when shown on a drawing of the boat itself. It’s also fascinating to watch the PR machine that this group is when you consider that they have a fully functioning video studio at their base in Valencia and you can watch the transmission over the Web as it’s happening over in Spain. Go to this link to see what they are saying or video archives of what’s been broadcast to date. This all-the-time availability of info controlled by the team verses occasional broadcast by a network shows how much news programing and distribution has changed over the years. Something else that’s changed a lot is the boats themselves. Hard to believe that less than 70 years separates the boats from the giant “J” boats from today’s. This short video clip shows the contrast between the monstrous boats of the 30s and today’s modern machines. What next? It will be very interesting to see what happens in the coming week and if the America’s cup will indeed end up on American soil once again. Fingers crossed. 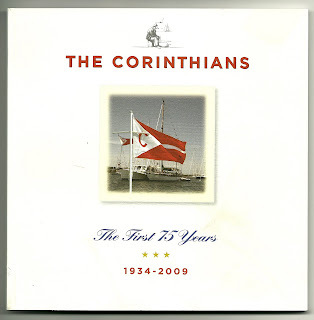 >As I have mentioned in past posts, I am involved, for many years, with a sailing group, The Corinthians. This genesis of the organization was primarily about yacht owners sailing their own boats, with unpaid crew, as opposed to paid captain and crew. The organization grew out of the Great Depression as a way for owners to continue sailing under changed circmstances. As we emerge, hopefully, from what some are calling the “great recession” what better time to celebrate our 75th anniversary and as a validation that we are as relevant now as we were at our founding 75 years ago. And what better way to celebrate this important milestone than with an event at the New York Yacht Club on 44th street in Manhattan. As the group’s shore activities chair, I have spent a number of years, more than I care to admit, as the one responsible for putting on events for the group such as our annual meeting, informal get-togethers in members homes and in this most recent case, a celebratory weekend in New York. In spite of near record snowfalls in Annapolis and Philadelphia, where many of our members live, nearly 160 gathered on Friday evening to celebrate, make new friends and to reconnect with others. We met in the model room, perhaps the most remarkable room in New York City. Check out this panoramic view of the room. It’s amazing. As many of our members are also members of The New York Yacht Club, it was very fitting that we should choose to celebrate there, a place that has been a part of our group for many years. We have traditionally held our holiday gam there, and in the same room as Friday’s event. This year was supposed to be even better and I wanted to be sure that we were able to really do it up so I knew that it had to be more than “just another party”. Here’s how it ended up going. On Friday afternoon nearly 60 of us enjoyed a one hour tour, with half of us being led by the club curator, Lindsay who led us through the model room, library and dining room and did a wonderful job of helping us better understand the club and it’s rich history. While this view isn’t of our event, it certainly speaks to the special occasion that can be had in the New York Yacht Club. Another highlight of the event was the debut of a book written by past master Bill Thomas chronicling the 75 year history of our group. Bill wrote and edited the entire book with design and production help from Jason Calfo. The two really out did themselves in producing a book worthy of our silver anniversary. Due to the generous donations from many of our members, a copy will be provided to all members free of charge. Extra copies will be available on the club website for purchase soon. The evening’s festivities was introduced with an a men’s a capella group The Columbia University Kingsman, an amazingly talented group of 7 young men who serenaded us to kick off the event. If you ever have an opportunity to see and hear them in concert or hire them for your event, I highly recommend it. They were just wonderful. The evening was wonderful, with a 7 piece dance band and great fellowship, food and drink. On Saturday morning nearly 60 members, met at the Metropolitan Museum of Art for a guided tour of selected nautical works. What a great job our guide did as she ran us from one end of the museum to the other, her enthusiasm and tremendous knowledge of the what the Met has to offer was clearly obvious for all to see. If you have never thought of having a special tour at the Met, I encourage you to consider one. For a group of 16 or more the museum will put together a custom tour just for you. The fees are very reasonable and it’s just a wonderful experience. Here’s a link that provides details on guided tours. After our visit to the Met, thanks to a fellow member Robin, a long time friend of our hosts, we moved about 10 blocks south for an afternoon tea with all the fixings at a private home with a truly remarkable collection of British Marine Art. Our host and hostess, Tom and Letty who contributed the complete spread of food, beautifully presented, graciously shared their knowledge and home. Their collection was wonderfully described in American Heritage Magazine and I encourage you to check out the article. Believe me, as great as the description is, to see the collection is to truly appreciate what a well intentioned and educated collector can assemble when given the opportunity. Our hosts are perhaps better described as British marine art scholars as to refer to them as just collectors doesn’t begin to do justice to their depth of knowledge. Seeing the pieces was a remarkable experience but hearing of how Tom and Letty went about assembling their collection, the thought behind each piece and why it was there, added immeasurably to the afternoon. I have often said that I give my time to The Corinthians because of getting so many nice notes and comments I get, perhaps the best “attaboy” I have gotten so far, was the special citation from Past Master Bob Ebin with whom I have worked for the last two years, when he recognized me with a special citation award on Friday at the event, in front of all of our guests. As if that wasn’t enough, I was stunned to be recognized with a second recognition, the “Keel Bolt” award, from the membership and awards committee for my years of work on events as well. This award has been presented yearly since 1971 and is constructed from a section of a keel bolt from the Yacht America, the yacht from which the Americas Cup was named. What a thrill it is to have a piece of history in my home for the next year and to be recognized by The Corinthians, that has been such an important group to me over the years. After all the planning with considerable help from others there comes the inevitable “morning after” when it’s time to get back into real life. It’s a quiet Sunday at home and I will now refocus my energies on the day to day and begin to think about getting Pandora back in the water. With less than two months till splash time, there’s lots to do. Now if the snow in Annapolis will just melt.